Barrel Sample. Smooth and opulent, this is a densely tannic wine. Its dark fruits and dusty texture are backed by juicy acidity and a core of framing tannins. It will be powerful and rich with age. A silky textured presence to this wine with a salty and minerally undertone. Full and beauty. Excellent backbone. 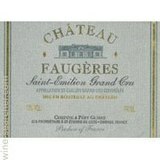 The 2015 FaugÃÂÃÂÃÂÃÂ¨res is a deep, sensual Saint-Emilion redolent of dark cherry, plum, mocha and savory herbs. Like all of Silvio Denz's wines, the FaugÃÂÃÂÃÂÃÂ¨res emphasizes textural richness and intensity. Readers will find plenty of both here. The blend is 80% Merlot, 15 Cabernet Franc and 5% Cabernet Sauvignon brought in between September 23 and October 12. Beautiful aromas and flavors of warm fig and boysenberry reduction lead off, with extra raspberry and cassis notes filling in behind them. Lush in feel, with the structure nicely embedded, letting extra licorice, fruitcake and singed mesquite details chime in. The finish ripples with fruit and fresh acidity. Best from 2023 through 2035. 7,917 cases made.